Thomson had a tragic childhood. His mother died when he was just a boy and his father took the family, five boys and a girl, from Ireland to America to begin again. Within the sight of shore, Thomson’s father died and the sea captain embezzled all of their money. Thomson closed his father’s eyes after hearing his final prayer, “God take them up.” The children were left at the mercy of the New World. Charles rose above it all and became a true American patriot. He became the leader of the Philadelphia “Sons of Liberty” and a good friend of Benjamin Franklin. 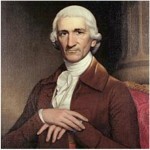 When the Continental Congress was formed, Thomson became its secretary – a post most scholars equate with a Prime Minister. For fifteen years Thomson served until the congress was finally adjourned. At its conclusion in July, 1789, Thomson retired to work on a translation of the Bible and wrote a synopsis of the four gospels published in 1815. You see Thomson was a Greek and Latin tutor for the famous Philadelphia Academy and what he is best known for today is his work on the Great Seal of the United States. “Novus ordo seclorum” means “New Order for the Ages.” Medieval Christians believed Virgil’s poem was a prophecy of the coming of Christ and Thomson, a Latin tutor well acquainted with Virgil, believed the founding of the United States was also part of God’s plan. It is popular today to tout the separation of church and state, but for the founding fathers there could be no separation of God and state. Think about that the next time you spend a dollar bill.